175. 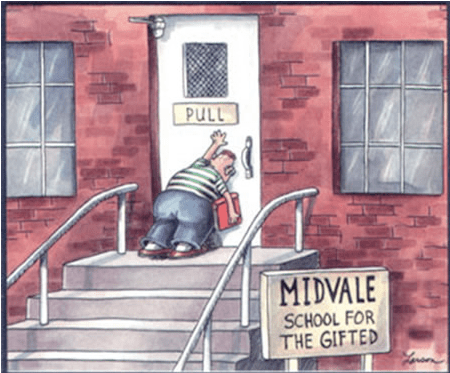 The Curse of Incorrect Door Handle Design and How It Can Be Fixed – How to Shape Human Behavior. 00:00:11 “Dammit, I hate the door on the 10th floor of the Vox Media office!” Thing is, they’re everywhere, and you probably run into obscure doors with incorrect handles on a daily basis. But why?! If people continually get the functionality of a door wrong, it’s the door maker’s fault; not yours. 00:01:22 Why be required to glue a ‘push’ or ‘pull’ sign onto the door when you could have started by using a relevant door handle to make it blantantly obvious? Discoverability. The user’s ability to discover and inherently understand what operations one can do with the door (or website, product, or application). Should I push? Pull? Click once or double click on the computer mouse? etc. Feedback. The user’s ability to know that an event has taken place after the user has performed an action, such as the ‘green light’ to let you know your phone is plugged in and fully charged, or the click sound on your coffee machine when you push the button to let you know your coffee machine is on. [EDITOR’S NOTE: In Janne Jul Jensen’s lecture User Interface Design: Step-By-Step User Interface Workshop, she explains that when it comes to shortcuts, CTRL+C; CTRL+P; etc… Everyone uses shortcuts. Shortcuts are brilliant because they cater to your expert users without bothering your novice users. Novices generally don’t start discovering shortcuts until they are ready to start using them. 00:03:02 Ideally, the process of improving things starts by observing people and their habits to generate ideas on how to make the world better. Then you develop and test a prototype you believe will solve the problem. This process happens over and over again until the problem has been solved. 00:03:42 An ‘ideal’ door would be a door you were not even aware you had opened or interacted with. With but a flat plate or a push bar, for example, there is nothing for a human to do but to push. A push sign wouldn’t be required to help navigate the problem of an unclear door. Posted on February 29, 2016 January 16, 2017 by Joshua SMITHPosted in interviewTagged 99pi, apple, cognitive science, computer science, don norman, joe posner, psychology, roman mars, user experience, vox.